Coconut oil is an edible oil extract derived from the copra or meat of mature coconuts. The creamy white meat is known for being high in saturated fats, and coconut oil is no different. More than 85 percent of coconut oil is composed of saturated fats, with lauric acid being the dominant fatty acid. The high fat content has made coconut oil unpopular in the past. 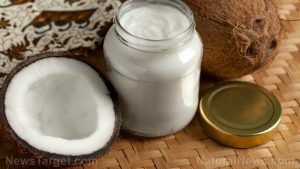 Nowadays, however, coconut oil has been redeemed somewhat ever since it was discovered that the saturated fats are harmless for the most part and may actually be beneficial. Coconut oil possesses a fatty acids profile that has made it a hot topic of debate for years. Besides the saturated fats, coconut oil also has polyunsaturated fats and monounsaturated fats, though it’s the saturated fats that are the most noteworthy. This is because they’re Medium Chain Triglycerides (MCT), meaning they’re easy digest and go directly to the liver to serve as energy sources or to become ketones. The most important MCTs are lauric acid, caprylic acid, and capric acid. Both lauric acid and caprylic acid have potent antiviral and antimicrobial properties, while capric acid has immune-boosting qualities. Moreover, coconut oil is rich in vitamin E, a nutrient that gives coconut oil its moisturizing properties. Coconut oil is calorie dense: 100 g can provide up to 884 calories. Also known as Systemic Candidiasis, candida is the most common type of yeast infection caused by fungal growth in the stomach. Coconut oil can treat this condition externally and internally. The moisture content prevents skin from peeling off or cracking, while the saturated fats work together to control the growth of the Candida albacans fungus. Coconut oil is highly effective in reducing plaque formation and staving off tooth decay and gingivitis. So much so that coconut oil is the preferred oil to use in the Ayurvedic practice of oil pulling, an oral detoxification procedure that can serve as an alternative mouthwash. The antimicrobial qualities of coconut oil can help in dealing with the bacteria or fungi that cause indigestion. One of the most popular benefits of coconut oil is for the skin. This oil is known to be an effective moisturizer that can reduce instances of flaking and dryness, reduce the appearances of wrinkles, and can even be used to treat all sorts of common skin problems. Fresh coconut oil has been described as having a sweet taste and nutty aroma, making it a good pair with baked goods and confectioneries. The high smoke point has given it a reputation as an ideal oil for deep frying meats and vegetables. There are many types of coconut oil, but the best one is unrefined organic coconut oil as it has the most health benefits and highest antioxidant levels. Though coconut oil is infamous for containing an abundance of fats, these fats are harmless and even beneficial. The antimicrobial and antiviral qualities of coconut oil make it an excellent remedy for candida and preventive measure against tooth decay, while the moisturizing qualities can be used to treat dry skin.